First Line: Just after eleven o'clock on a bright spring morning, the sort of day when the sunshine is almost white and promises a warmth that it doesn't quite deliver, Diana Cowper crossed the FullhamRoad and went into a funeral parlour. Diana Cowper went into a funeral parlor and made arrangements for her own funeral. Six hours later, she was dead. Enter Daniel Hawthorne, a disgraced former police detective and absolutely brilliant investigator who's now called in to consult on cases by Scotland Yard. Hawthorne is looking for a ghostwriter to document his life-- a Watson to his Holmes. He's looked around and has chosen Anthony Horowitz for the job. Horowitz rather unwillingly agrees and immediately finds himself drawn into an investigation-- and a story-- he cannot control. Hawthorne is impossible to work with, but this latest case of his with all its twists and turns is irresistible. The writer and the detective form an unusual partnership in an attempt to solve this most convoluted of cases. At first, I was hesitant to pick up The Word Is Murder, for fear that "author-as-character" was simply a gimmick. I can now attest that, even if it is a gimmick, it works brilliantly. I loved this book! But when you put two wonderful characters together and then add a plot that resembles Russian nesting dolls on a massive dose of steroids, magic happens. I figured parts of the mystery out but came nowhere close to knowing the whole thing. Small details of appearance, of speech, of family history, of job history-- and more-- play their parts in the mystery. One small event can have implications for all those that follow, and there are always consequences. It's just a marvelous piece of storytelling. I read that The Word Is Murder is the first in a series, and I couldn't be happier. I can't wait to see what Horowitz has up his sleeve next! I read it and really liked it too. Glad it's a series. 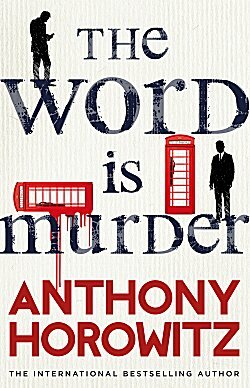 I'm really liking the things that Anthony Horowitz writes. Of course, I've loved his TV involvement for years. I have this book and will get to it soon. Wasn't sure how that 'author in the actual story' would work, but it seems it's done well. TV, books... he's pretty much golden as far as I'm concerned! Intriguing. What's the time period?